Looks like I owe an apology to Ohio. My bitterness over the 2004 election debacle has caused me to be a bit dismissive of the entire state at times. However, after watching this video of Representative Marcy Kaptur, a Democrat from Ohio’s 9th District, addressing the House, I am humbled. Why isn’t this woman running for President? Thanks to CSPANJunkie for watching CSPAN constantly, so the rest of us don’t have to. 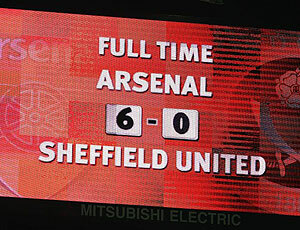 Today’s Carling Cup match at the Emirates had Sheffield United FC (one of my least favorite clubs) licking their wounds, and true Gooners licking their lips. The Young Guns demolished The Blades, 6-0, and moved into the fourth round. With complete disregard for the fact that I am shelling out 80 smackers a month for DirecTV for the sole purpose of getting to see Arsenal play, neither FSC or Setanta aired the Gunners match, with the latter preferring to show Swansea-Cardiff (are you having a laugh?!). 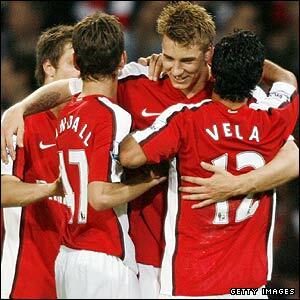 Carlos Vela scored a hat trick, Nicholas Bendtner a brace, while Jack Wilshire had one of his own. Despite it not being on the telly here, I managed to find highlights of the goals. A great night for the youngsters! You’ve made us proud lads! I was looking for a video of Generation X doing “Youth Youth Youth”, but all I could find was “Wild Youth”, which is also somewhat apropos. Chuck Hagel smears the lipstick! Will wonders never cease? I mean, how often do we get to single out a Republican for their honesty? Really? Well, Chuck Hagel, the United States Senator from Nebraska, and a senior member of the Senate Foreign Relations Committee, told the Omaha-World Herald, his party’s vice presidential nominee, Sarah Palin, lacks foreign policy experience and called it a “stretch” to say she’s qualified to be president. Could Palin lead the country if GOP presidential nominee John McCain could not? “I think it’s a stretch to, in any way, to say that she’s got the experience to be president of the United States,” Hagel said. Thank you Chuck, for having some integrity. Given some of your positions on the war and immigration, as well as your sound assessment of the Bush Administration, particularly where you said, it is my opinion that this is one of the most arrogant, incompetent administrations I’ve ever seen personally or ever read about, you sure you won’t consider changing parties?